Jo's Bun's - Hot, Cross, Delicious and REAL! I am bouncing back from two weeks of rubbish, into sunshine, health and the prospect of a lot of chocolate coming my way. To celebrate all things spring and of course, Easter, I have developed a REAL hot cross bun. Bet you've never had a real one, have you? They are REAL as they have no unnatural ingredients and are left to mature before baking in the old, traditional way - no commercial yeast used! I am selling these for 50p each, although there is a minimum order of 4 buns. Minimum weight for each bun is 90g (industrial buns are more like 70g or less). Wheat flour, mixed dried fruit (31%) (currants, sultanas, mixed peel), water yeast, sugar, rapeseed oil, pasteurised free range egg, invert sugar syrup, palm oil, emulsifiers mono- and diglycerides of fatty acids and mono- and diacetyl tartaric acid esters of mono- and diglycerides of fatty acids, lemon juice, raising agents disodium diphosphate and potassium hydrogen carbonate, mixed spices, maize glucose syrup, flour treatment agent ascorbic acid, salt, pasteurised free range egg white, palm fat, milk proteins, maize starch, flavouring, Mixed peel contains wheat glucose-fructose syrup, orange peel, invert sugar syrup, lemon peel, citric acid. Organic flour, milk, butter, currants, water, sugar, free range egg, mixed spices, salt, vegetable oil. JO'S LOAVES BUN is 50p. To be fair, I do sympathise with Waitrose that even with that impressively long list of additives, they still have to add FLAVOURING to their buns. Shame. 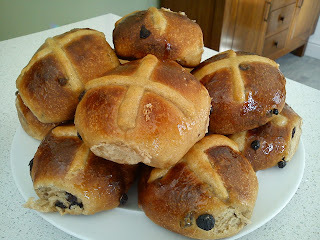 If I get a run of orders on Hot Cross Buns, I might prep some on Thursday 5th and bake for Good Friday. Afterall, that's the traditional way.